Pope Boniface IX (1356 – October 1, 1404), born Piero Tomacelli, was the second Roman Pope of the Western Schism from November 2, 1389 – until October 1, 1404. 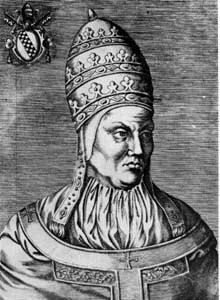 During his time the antipope Clement VII (1378–94) continued to hold court as pope in Avignon under the protection of the French monarchy. Piero (also Perino, Pietro) Tomacelli came of an ancient but impoverished baronial family of Casarano in the Kingdom ofNaples. An unsympathetic German contemporary source, Dietrich of Nieheim, asserted that he was illiterate (nesciens scribere etiam male cantabat); neither a trained theologian nor skilled in the business of the Curia, he was tactful and prudent in a difficult era, but Ludwig Pastor, who passes swiftly over his pontificate, says, "The numerous endeavours for unity made during this period form one of the saddest chapters in the history of the Church. Neither Pope had the magnanimity to put an end to the terrible state of affairs" by resigning. Germany, England, Hungary, Poland, and the greater part of Italy accepted him as pope, (he and the Avignon Pope Clement VII having mutually excommunicated one another) but the day before Tomacelli's election by the fourteen cardinals who remained faithful to the papacy at Rome, Clement VII at Avignon had just crowned a French prince, Louis II of Anjou, King of Naples. The youthful Ladislaus was rightful heir of Charles III of Naples, assassinated in 1386, and Margaret of Durazzo, scion of a line that had traditionally supported the popes in their struggles in Rome with the anti-papal party in the city itself. Boniface IX saw to it that Ladislaus was crowned King of Naples at Gaeta May 29, 1390) and worked with him for the next decade to expel the Angevin forces from southern Italy. In the course of his reign Boniface IX finally extinguished the troublesome independence of the commune of Rome and established temporal control, though it required fortifying not only the Castel Sant'Angelo, but the very bridges, and for long seasons he was forced to reside in more peaceful surroundings, at Assisi or Perugia. He also took over the port of Ostia from its Cardinal Bishop. In the Papal States Boniface IX gradually regained control of the chief castles and cities, and he re-founded the States as they would appear during the fifteenth century. Clement VII died at Avignon, September 16, 1394, but the French cardinals quickly elected a successor, on September 28: Cardinal Pedro de Luna, who took the name Benedict XIII (1394—1423). Over the next few years Boniface IX was entreated to abdicate, even by his strongest supporters: Richard II of England (in 1396), the Diet of Frankfurt (in 1397), and King Wenceslaus of Germany (at Reims, 1398). But he refused. Pressure for an ecumenical council also grew as the only way to breach the Great Schism, but the conciliar movement made no headway during Boniface IX's papacy. During the reign of Boniface IX two jubilees were celebrated at Rome. The first, in 1390, had been declared by his predecessor Pope Urban VI, and was largely frequented by people from Germany, Hungary, Poland, Bohemia, and England. Several cities of Germany obtained the "privileges of the jubilee", as indulgences were called, but the preaching of indulgences gave rise to abuses and scandal. The jubilee of 1400 drew to Rome great crowds of pilgrims, particularly from France, in spite of a disastrous plague. Pope Boniface IX remained in the city. In the latter part of 1399 there arose bands of self-flagellating penitents, known as the Bianchi, or Albati ("White Penitents"), especially in Provence, where the Albigenses had been exterminated less than a century before, and spreading to Spain and northern Italy. These evoked uneasy memories of the mass processions of wandering flagellants of the Black Death period, 1348—1349. They went in procession from city to city, clad in white garments, with faces hooded, and wearing on their backs a red cross, following a leader who carried a large cross. Rumors of imminent divine judgement and visions of the Virgin Mary abounded. They sang the newly popular hymn Stabat Mater during their processions. For a while, as the White Penitents approached Rome, gaining adherents along the way, Boniface IX and the Curia supported their penitential enthusiasm, but when they reached Rome, Boniface IX had their leader burnt at the stake, and they soon dispersed. "Boniface IX gradually discountenanced these wandering crowds, an easy prey of agitators and conspirators, and finally dissolved them." as the Catholic Encyclopedia reports. In England the anti-papal preaching of John Wyclif supported the opposition of the King and the higher clergy to Boniface IX's habit of granting English benefices as they fell vacant to favorites in the Roman Curia. Boniface IX introduced a novelty in the form of revenue known as annates perpetuæ, withholding half the first year's income of every benefice granted in the Roman Court. The pope's agents also now sold not simply a vacant benefice but the expectation of one; and when an expectation had been sold, if another offered a larger sum for it, the pope voided the first sale; the unsympathetic observer Dietrich von Nieheim reports that he saw the same benefice sold several times in one week, and that the Pope talked business with his secretaries during Mass. There was resistance in England, the staunchest supporter of the Roman papacy during the Schism: the English Parliament confirmed and extended the statutes of Provisors and Praemunire of Edward III of England (1327–77), giving the king veto power over papal appointments in England. Boniface IX was defeated in the face of a unified front, and the long controversy was finally settled, to the English king's satisfaction. Nevertheless, at the Synod of London (1396), the English bishops convened to condemn Wyclif. In Germany the Electors had met at Rhense (August 20, 1400) to depose the unworthy Wenceslaus, and had chosen in his place Rupert, Duke of Bavaria and Rhenish Count Palatine. In 1403 Boniface IX made the best of it and approved the deposition and recognized Rupert. In 1398 and 1399 Boniface IX appealed to Christian Europe in favor of the Byzantine emperor Manuel II Palaeologus, threatened at Constantinople by Sultan Bayezid I, but there was little enthusiasm for a new crusade at such a time. Saint Birgitta of Sweden was canonized by Pope Boniface IX, October 7, 1391. The universities of Ferrara (1391) and Fermo (1398) owe him their origin, and that of Erfurt (in Germany), its confirmation (1392). Boniface IX died in 1404 after a brief illness. Boniface IX was a frank politician, strapped for cash like the other princes of Europe, as the costs of modern warfare rose and supporters needed to be encouraged by gifts, for [fourteenth-century government depended upon such personal support as a temporal ruler could gather and retain. All of the princes of the late fourteenth century were accused of avaricious money-grubbing by contemporary critics, but among them contemporaries ranked Boniface IX exceptional. Traffic in benefices, the sale of dispensations, and the like, did not cover the loss of local sources of revenue in the long absence of the papacy from Rome, foreign revenue diminished by the schism, expenses for the pacification and fortification of Rome, the constant wars necessitated by French ambition and the piecemeal reconquest of the Papal States. Boniface IX certainly provided generously for his mother, his brothers Andrea and Giovanni, and his nephews in the spirit of the day. The Curia was perhaps equally responsible for new financial methods that were destined in the next century to arouse bitter feelings against Rome, particularly in Germany. Elected at Rome, 2 November, 1389, as successor of the Roman Pope, Urban VI; d. there, 1 October, 1404. Piero (Perino, Pietro) Tomacelli came of an ancient but impoverished baronial family of Naples. He lacked good theological training and skill in the conduct of curial business, but was by nature tactful and prudent. His firm character and mild manner did much to restore respect for the papacy in the countries of his own obedience (Germany, England, Hungary, Poland, and the greater part of Italy). The Avignon Pope, Clement VII, had just crowned (1 November, 1389) as King of Naples the French prince, Louis of Anjou. Boniface took up the cause of the youthful Ladislaus, heir of Charles III of Naples and Margaret of Durazzo, had him crowned King of Naples at Gaeta (29 May, 1390), and for the next decade aided him efficiently to expel the Angevin forces from Italy. In the course of his reign Boniface extinguished the municipal independence of Rome and established the supremacy of the pope. He secured the final adhesion of the Romans (1398) by fortifying anew the Castle of Sant' Angelo, the bridges, and other points of vantage. He also took over the port of Ostia from its cardinal-bishop. In the Papal States Boniface gradually regained control of the chief strongholds and cities, and is the true founder of these States as they appear in the fifteenth century. Owing to the faithlessness and violence of the Romans he resided frequently at Perugia, Assisi, and elsewhere. Clement VII, the Avignon pope, died 16 September, 1394. Boniface had excommunicated him shortly after his own election, and in turn had been excommunicated by Clement. In 1392 Boniface attempted, but in vain, to enter into closer relations with Clement for the re-establishment of ecclesiastical unity, whereupon Boniface reasserted with vigour his own legitimacy. Clement was succeeded at Avignon, 28 September, 1394, by Cardinal Pedro de Luna, as Benedict XIII. Suffice it to say here that Boniface always claimed to be the true pope, and at all times rejected the proposal to abdicate even when it was supported by the principal members of his own obedience, e.g. Richard II of England (1396), the Diet of Frankfort (1397), and King Wenceslaus of Germany (Reims, 1398). During the reign of Boniface two jubilees were celebrated at Rome. The first took place in 1396, in compliance with an ordinance of his predecessor Urban VI, and was largely frequented from Germany, Hungary, Poland, Bohemia, and England. Several cities of Germany obtained the privileges of the jubilee, but the preaching of the indulgences gave rise to abuses and to impositions on the part of unaccredited agents of the pope, so that he was obliged to proceed against them with severity. The jubilee of 1400 drew to Rome great crowds of pilgrims, particularly from France. In spite of a disastrous plague Boniface remained at his post. In the latter part of 1399 bands of penitents, known as the Bianchi, or Albati (White Penitents), arose, especially in Provence and Italy. They went in procession from city to city, clad in white garments, with faces hooded, only the eyes being left uncovered, and wearing on their backs a red cross. For a while their penitential enthusiasm had some good results. After they had satisfied their spiritual ardour at Rome, Boniface gradually discountenanced these wandering crowds, an easy prey of agitators and conspirators, and finally dissolved them. In England the anti-papal virulence of Wycliff increased the opposition of both Crown and clergy to the methods of Boniface in the granting of such English benefices as fell vacant in the Roman Curia through the death or promotion of the incumbent. The Parliament confirmed and extended more than once the statutes of Provisors and Præmunire, of Edward III. Boniface protested vigorously, particularly in 1391, but in the end found himself unable to execute his grants without the king's consent and sanction. "Thus ended", says Lingard (ad. an. 1393), "this long and angry controversy entirely to the advantage of the Crown." Nevertheless, at the Synod of London (1396), the English Church condemned the anti-papal teachings of Wyclif, and in 1398 the University of Oxford, consulted by Richard II, issued in favour of Boniface an influential document, while in 1390 and again in 1393 the spiritual peers upheld the right of the pope to excommunicate even those who obeyed the statutes of Provisors. In Germany the electors had deposed at Rhense (20 August, 1400) the unworthy Wenceslaus, King of the Romans, and had chosen in his place Rupert, Duke of Bavaria and Rhenish Count Palatine. In 1403 Boniface abandoned his uncertain attitude towards both, approved the deposition of Wenceslaus as done by papal authority, and recognized the election of Rupert. In 1398 and 1399 Boniface appealed to Christian Europe in favour of Emperor Emmanuel, threatened at Constantinople by Sultan Bajazet. St. Bridget of Sweden was canonized by Boniface, 7 October, 1391. The universities of Ferrara (1391) and Fermo (1398) owe him their origin, and that of Erfurt its confirmation (1392). In 1404 Benedict XIII sent the last of his embassies to Boniface, who received the agents of Benedict 29 September, but the interview ended unfavourably. The pope, highly irritated, took to his bed with an attack of gravel, and died after an illness of two days. Contemporary and later chroniclers praise the political virtues of Boniface, also the purity of his life, and the grandeur of his spirit. Some, like Dietrich of Niem, charge him with an inordinate love of money, dishonest traffic in benefices, the sale of dispensations, etc. But Dietrich is no impartial writer and is blamed by Reynaldus for being bitter and unjust (acertus et iniquis). In his gossipy pages one misses a proper appreciation of the difficulties that surrounded Boniface—local sources of revenue lost in the long absence of the papacy from Rome, foreign revenue diminished by the schism, extraordinary expenses for the restoration of papal Rome and the reconquest of the Papal States, the constant wars necessitated by French ambition, the inheritance of the financial methods of Avignon, and the obligation of conciliating supporters in and out of Italy. Boniface sought nothing for himself and died poor. He is also charged with nepotism and he certainly provided generously for his mother, brothers, and nephews. It may be said, however, that in the semi-anarchic conditions of the time good government depended upon such personal support as a temporal ruler could gather and retain, i.e. could reward, while fidelity was best secured by close domestic ties. Boniface was the first pope to introduce the form of revenue known as annates perpetuæ, or reservation of one-half the first year's fruits of every benefice granted in the Roman Court, this in addition to other traditional expenses. It must be remembered that at this time the cardinals claimed a large part of these revenues, so that the Curia was perhaps more responsible than the pope for new financial methods destined in the next century to arouse bitter feelings against Rome, particularly in Germany.